I had a vision once—you may all have had a like one—of the stream of time flowing through a limitless land. Along its banks sprang up in succession the generations of man. They did not move with the stream-they lived their lives and sank away; and always below them new generations appeared, to play their brief parts in what is called history—the sequence of human actions. The stream flowed on, opening for itself forever a way through the land. I saw that these successive dwellers on the stream were busy in constructing and setting afloat vessels of various size and form and rig—arks, galleys, galleons, sloops, brigs, boats propelled by oars, by sails, by steam. I saw the anxiety with which each builder launched his venture, and watched its performance and progress. The anxiety was to invent and launch something that should float on to the generations to come, and carry the name of the builder and the fame of his generation. It was almost pathetic, these puny efforts, because faith always sprang afresh in the success of each new venture. Many of the vessels could scarcely be said to be launched at all; they sank like lead, close to the shore. Others floated out for a time, and then, struck by a flaw in the wind, heeled over and disappeared. Some, not well put together, broke into fragments in the buffeting of the waves. Others danced on the flood, taking the sun on their sails, and went away with good promise of a long voyage. But only a few floated for any length of time, and still fewer were ever seen by the generation succeeding that which launched them. The shores of the stream were strewn with wrecks; there lay bleaching in the sand the ribs of many a once gallant craft. Innumerable were the devices of the builders to keep their inventions afloat. Some paid great attention to the form of the hull, others to the kind of cargo and the loading of it, while others—and these seemed the majority—trusted more to some new sort of sail, or new fashion of rudder, or new application of propelling power. And it was wonderful to see what these new ingenuities did for a time, and how each generation was deceived into the belief that its products would sail on forever. But one fate practically came to the most of them. They were too heavy, they were too light, they were built of old material, and they went to the bottom, they went ashore, they broke up and floated in fragments. And especially did the crafts built in imitation of something that had floated down from a previous generation come to quick disaster. I saw only here and there a vessel, beaten by weather and blackened by time --so old, perhaps, that the name of the maker was no longer legible; or some fragments of antique wood that had evidently come from far up the stream. When such a vessel appeared there was sure to arise great dispute about it, and from time to time expeditions were organized to ascend the river and discover the place and circumstances of its origin. Along the banks, at intervals, whole fleets of boats and fragments had gone ashore, and were piled up in bays, like the driftwood of a subsided freshet. Efforts were made to dislodge these from time to time and set them afloat again, newly christened, with fresh paint and sails, as if they stood a better chance of the voyage than any new ones. Indeed, I saw that a large part of the commerce of this river was, in fact, the old hulks and stranded wrecks that each generation had set afloat again. As I saw it in this foolish vision, how pathetic this labor was from generation to generation; so many vessels launched; so few making a voyage even for a lifetime; so many builders confident of immortality; so many lives outlasting this coveted reputation! And still the generations, each with touching hopefulness, busied themselves with this child’s play on the banks of the stream; and still the river flowed on, whelming and wrecking the most of that so confidently committed to it, and bearing only here and there, on its swift, wide tide, a ship, a boat, a shingle. These hosts of men whom I saw thus occupied since history began were authors; these vessels were books; these heaps of refuse in the bays were great libraries. The allegory admits of any amount of ingenious parallelism. It is nevertheless misleading; it is the illusion of an idle fancy. I have introduced it because it expresses, with some whimsical exaggeration—not much more than that of “The Vision of Mirza”—the popular notion about literature and its relation to human life. In the popular conception, literature is as much a thing apart from life as these boats on the stream of time were from the existence, the struggle, the decay of the generations along the shore. I say in the popular conception, for literature is wholly different from this, not only in its effect upon individual lives, but upon the procession of lives upon this earth; it is not only an integral part of all of them, but, with its sister arts, it is the one unceasing continuity in history. Literature and art are not only the records and monuments made by the successive races of men, not only the local expressions of thought and emotion, but they are, to change the figure, the streams that flow on, enduring, amid the passing show of men, reviving, transforming, ennobling the fleeting generations. Without this continuity of thought and emotion, history would present us only a succession of meaningless experiments. The experiments fail, the experiments succeed—at any rate, they end—and what remains for transmission, for the sustenance of succeeding peoples? Nothing but the thought and emotion evolved and expressed. It is true that every era, each generation, seems to have its peculiar work to do; it is to subdue the intractable earth, to repel or to civilize the barbarians, to settle society in order, to build cities, to amass wealth in centers, to make deserts bloom, to construct edifices such as were never made before, to bring all men within speaking distance of each other—lucky if they have anything to say when that is accomplished—to extend the information of the few among the many, or to multiply the means of easy and luxurious living. Age after age the world labors for these things with the busy absorption of a colony of ants in its castle of sand. And we must confess that the process, such, for instance, as that now going on here—this onset of many peoples, which is transforming the continent of America—is a spectacle to excite the imagination in the highest degree. If there were any poet capable of putting into an epic the spirit of this achievement, what an epic would be his! Can it be that there is anything of more consequence in life than the great business in hand, which absorbs the vitality and genius of this age? Surely, we say, it is better to go by steam than to go afoot, because we reach our destination sooner—getting there quickly being a supreme object. It is well to force the soil to yield a hundred-fold, to congregate men in masses so that all their energies shall be taxed to bring food to themselves, to stimulate industries, drag coal and metal from the bowels of the earth, cover its surface with rails for swift-running carriages, to build ever larger palaces, warehouses, ships. This gigantic achievement strikes the imagination. If the world in which you live happens to be the world of books, if your pursuit is to know what has been done and said in the world, to the end that your own conception of the value of life may be enlarged, and that better things may be done and said hereafter, this world and this pursuit assume supreme importance in your mind. But you can in a moment place yourself in relations—you have not to go far, perhaps only to speak to your next neighbor—where the very existence of your world is scarcely recognized. All that has seemed to you of supreme importance is ignored. You have entered a world that is called practical, where the things that we have been speaking of are done; you have interest in it and sympathy with it, because your scheme of life embraces the development of ideas into actions; but these men of realities have only the smallest conception of the world that seems to you of the highest importance; and, further, they have no idea that they owe anything to it, that it has ever influenced their lives or can add anything to them. And it may chance that you have, for the moment, a sense of insignificance in the small part you are playing in the drama going forward. Go out of your library, out of the small circle of people who talk of books, who are engaged in research, whose liveliest interest is in the progress of ideas, in the expression of thought and emotion that is in literature; go out of this atmosphere into a region where it does not exist, it may be into a place given up to commerce and exchange, or to manufacturing, or to the development of certain other industries, such as mining, or the pursuit of office—which is sometimes called politics. You will speedily be aware how completely apart from human life literature is held to be, how few people regard it seriously as a necessary element in life, as anything more than an amusement or a vexation. I have in mind a mountain district, stripped, scarred, and blackened by the ruthless lumbermen, ravished of its forest wealth; divested of its beauty, which has recently become the field of vast coal-mining operations. Remote from communication, it was yesterday an exhausted, wounded, deserted country. Today audacious railways are entering it, crawling up its mountain slopes, rounding its dizzy precipices, spanning its valleys on iron cobwebs, piercing its hills with tunnels. Drifts are opened in its coal seams, to which iron tracks shoot away from the main line; in the woods is seen the gleam of the engineer’s level, is heard the rattle of heavily-laden wagons on the newly-made roads; tents are pitched, uncouth shanties have sprung up, great stables, boarding-houses, stores, workshops; the miner, the blacksmith, the mason, the carpenter have arrived; households have been set up in temporary barracks, children are already there who need a school, women who must have a church and society; the stagnation has given place to excitement, money has flowed in, and everywhere are the hum of industry and the swish of the goad of American life. On this hillside, which in June was covered with oaks, is already in October a town; the stately trees have been felled; streets are laid out and graded and named; there are a hundred dwellings, there are a store, a post-office, an inn; the telegraph has reached it, and the telephone and the electric light; in a few weeks more it will be in size a city, with thousands of people—a town made out of hand by drawing men and women from other towns, civilized men and women, who have voluntarily put themselves in a position where they must be civilized over again. This is a marvelous exhibition of what energy and capital can do. You acknowledge as much to the creators of it. You remember that not far back in history such a transformation as this could not have been wrought in a hundred years. This is really life, this is doing something in the world, and in the presence of it you can see why the creators of it regard your world, which seemed to you so important, the world whose business is the evolution and expression of thought and emotion, as insignificant. Here is a material addition to the business and wealth of the race, here employment for men who need it, here is industry replacing stagnation, here is the pleasure of overcoming difficulties and conquering obstacles. Why encounter these difficulties? In order that more coal may be procured to operate more railway trains at higher speed, to supply more factories, to add to the industrial stir of modern life. The men who projected and are pushing on this enterprise, with an executive ability that would maintain and maneuver an army in a campaign, are not, however, consciously philanthropists, moved by the charitable purpose of giving employment to men, or finding satisfaction in making two blades of grass grow where one grew before. They enjoy no doubt the sense of power in bringing things to pass, the feeling of leadership and the consequence derived from its recognition; but they embark in this enterprise in order that they may have the position and the luxury that increased wealth will bring, the object being, in most cases, simply material advantages—sumptuous houses, furnished with all the luxuries which are the signs of wealth, including, of course, libraries and pictures and statuary and curiosities, the most showy equipages and troops of servants; the object being that their wives shall dress magnificently, glitter in diamonds and velvets, and never need to put their feet to the ground; that they may command the best stalls in the church, the best pews in the theatre, the choicest rooms in the inn, and—a consideration that Plato does not mention, because his world was not our world—that they may impress and reduce to obsequious deference the hotel clerk. This life—for this enterprise and its objects are types of a considerable portion of life—is not without its ideal, its hero, its highest expression, its consummate flower. It is expressed in a word which I use without any sense of its personality, as the French use the word Barnum—for our crude young nation has the distinction of adding a verb to the French language, the verb to barnum—it is expressed in the well-known name Croesus. This is a standard—impossible to be reached perhaps, but a standard. If one may say so, the country is sown with seeds of Croesus, and the crop is forward and promising. The interest to us now in the observation of this phase of modern life is not in the least for purposes of satire or of reform. We are inquiring how wholly this conception of life is divorced from the desire to learn what has been done and said to the end that better things may be done and said hereafter, in order that we may understand the popular conception of the insignificant value of literature in human affairs. But it is not aside from our subject, rather right in its path, to take heed of what the philosophers say of the effect in other respects of the pursuit of wealth. One cause of the decay of the power of defense in a state, says the Athenian Stranger in Plato’s Laws—one cause is the love of wealth, which wholly absorbs men and never for a moment allows them to think of anything but their private possessions; on this the soul of every citizen hangs suspended, and can attend to nothing but his daily gain; mankind are ready to learn any branch of knowledge and to follow any pursuit which tends to this end, and they laugh at any other; that is the reason why a city will not be in earnest about war or any other good and honorable pursuit. The accumulation of gold in the treasury of private individuals, says Socrates, in the Republic, is the ruin of democracy. They invent illegal modes of expenditure; and what do they or their wives care about the law? “And then one, seeing another’s display, proposes to rival him, and thus the whole body of citizens acquires a similar character. “After that they get on in a trade, and the more they think of making a fortune, the less they think of virtue; for when riches and virtue are placed together in the balance, the one always rises as the other falls. “And in proportion as riches and rich men are honored in the state, virtue and the virtuous are dishonored. “And what is honored is cultivated, and that which has no honor is neglected. “And so at last, instead of loving contention and glory, men become lovers of trade and money, and they honor and reverence the rich man and make a ruler of him, and dishonor the poor man. The object of a reasonable statesman (it is Plato who is really speaking in the Laws) is not that the state should be as great and rich as possible, should possess gold and silver, and have the greatest empire by sea and land. The citizen must, indeed, be happy and good, and the legislator will seek to make him so; but very rich and very good at the same time he cannot be; not at least in the sense in which many speak of riches. For they describe by the term “rich” the few who have the most valuable possessions, though the owner of them be a rogue. And if this is true, I can never assent to the doctrine that the rich man will be happy: he must be good as well as rich. And good in a high degree and rich in a high degree at the same time he cannot be. Some one will ask, Why not? And we shall answer, Because acquisitions which come from sources which are just and unjust indifferently are more than double those which come from just sources only; and the sums which are expended neither honorably nor disgracefully are only half as great as those which are expended honorably and on honorable purposes. Thus if one acquires double and spends half, the other, who is in the opposite case and is a good man, cannot possibly be wealthier than he. The first (I am speaking of the saver, and not of the spender) is not always bad; he may indeed in some cases be utterly bad, but as I was saying, a good man he never is. For he who receives money unjustly as well as justly, and spends neither justly nor unjustly, will be a rich man if he be also thrifty. On the other hand, the utterly bad man is generally profligate, and therefore poor; while he who spends on noble objects, and acquires wealth by just means only, can hardly be remarkable for riches any more than he can be very poor. The argument, then, is right in declaring that the very rich are not good, and if they are not good they are not happy. Men cannot be happy unless they are good, and they cannot be good unless the care of the soul occupies the first place in their thoughts. That is the first interest of man; the interest in the body is midway; and last of all, when rightly regarded, is the interest about money. The majority of mankind reverses this order of interests, and therefore it sets literature to one side as of no practical account in human life. More than this, it not only drops it out of mind, but it has no conception of its influence and power in the very affairs from which it seems to be excluded. It is my purpose to show not only the close relation of literature to ordinary life, but its eminent position in life, and its saving power in lives which do not suspect its influence or value. Just as it is virtue that saves the state, if it be saved, although the majority do not recognize it and attribute the salvation of the state to energy, and to obedience to the laws of political economy, and to discoveries in science, and to financial contrivances; so it is that in the life of generations of men, considered from an ethical and not from a religious point of view, the most potent and lasting influence for a civilization that is worth anything, a civilization that does not by its own nature work its decay, is that which I call literature. It is time to define what we mean by literature. We may arrive at the meaning by the definition of exclusion. We do not mean all books, but some books; not all that is written and published, but only a small part of it. We do not mean books of law, of theology, of politics, of science, of medicine, and not necessarily books of travel, or adventure, or biography, or fiction even. These may all be ephemeral in their nature. The term belles-lettres does not fully express it, for it is too narrow. In books of law, theology, politics, medicine, science, travel, adventure, biography, philosophy, and fiction there may be passages that possess, or the whole contents may possess, that quality which comes within our meaning of literature. It must have in it something of the enduring and the universal. When we use the term art, we do not mean the arts; we are indicating a quality that may be in any of the arts. In art and literature we require not only an expression of the facts in nature and in human life, but of feeling, thought, emotion. There must be an appeal to the universal in the race. It is, for example, impossible for a Christian today to understand what the religious system of the Egyptians of three thousand years ago was to the Egyptian mind, or to grasp the idea conveyed to a Chinaman’s thought in the phrase, “the worship of the principle of heaven”; but the Christian of today comprehends perfectly the letters of an Egyptian scribe in the time of Thotmes III., who described the comical miseries of his campaign with as clear an appeal to universal human nature as Horace used in his ‘Iter Brundusium;’ and the maxims of Confucius are as comprehensible as the bitter-sweetness of Thomas a Kempis. De Quincey distinguishes between the literature of knowledge and the literature of power. The definition is not exact; but we may say that the one is a statement of what is known, the other is an emanation from the man himself; or that one may add to the sum of human knowledge, and the other addresses itself to a higher want in human nature than the want of knowledge. We select and set aside as literature that which is original, the product of what we call genius. As I have said, the subject of a production does not always determine the desired quality which makes it literature. A biography may contain all the facts in regard to a man and his character, arranged in an orderly and comprehensible manner, and yet not be literature; but it may be so written, like Plutarch’s Lives or Defoe’s account of Robinson Crusoe, that it is literature, and of imperishable value as a picture of human life, as a satisfaction to the want of the human mind which is higher than the want of knowledge. And this contribution, which I desire to be understood to mean when I speak of literature, is precisely the thing of most value in the lives of the majority of men, whether they are aware of it or not. It may be weighty and profound; it may be light, as light as the fall of a leaf or a bird’s song on the shore; it may be the thought of Plato when he discourses of the character necessary in a perfect state, or of Socrates, who, out of the theorem of an absolute beauty, goodness, greatness, and the like, deduces the immortality of the soul; or it may be the love song of a Scotch plowman: but it has this one quality of answering to a need in human nature higher than a need for facts, for knowledge, for wealth. In noticing the remoteness in the popular conception of the relation of literature to life, we must not neglect to take into account what may be called the arrogance of culture, an arrogance that has been emphasized, in these days of reaction from the old attitude of literary obsequiousness, by harsh distinctions and hard words, which are paid back by equally emphasized contempt. The apostles of light regard the rest of mankind as barbarians and Philistines, and the world retorts that these self-constituted apostles are idle word-mongers, without any sympathy with humanity, critics and jeerers who do nothing to make the conditions of life easier. It is natural that every man should magnify the circle of the world in which he is active and imagine that all outside of it is comparatively unimportant. Everybody who is not a drone has his sufficient world. To the lawyer it is his cases and the body of law, it is the legal relation of men that is of supreme importance; to the merchant and manufacturer all the world consists in buying and selling, in the production and exchange of products; to the physician all the world is diseased and in need of remedies; to the clergyman speculation and the discussion of dogmas and historical theology assume immense importance; the politician has his world, the artist his also, and the man of books and letters a realm still apart from all others. And to each of these persons what is outside of his world seems of secondary importance; he is absorbed in his own, which seems to him all-embracing. To the lawyer everybody is or ought to be a litigant; to the grocer the world is that which eats, and pays—with more or less regularity; to the scholar the world is in books and ideas. One realizes how possessed he is with his own little world only when by chance he changes his profession or occupation and looks back upon the law, or politics, or journalism, and sees in its true proportion what it was that once absorbed him and seemed to him so large. When Socrates discusses with Gorgias the value of rhetoric, the use of which, the latter asserts, relates to the greatest and best of human things, Socrates says: I dare say you have heard men singing—at feasts the old drinking-song, in which the singers enumerate the goods of life-first, health; beauty next; thirdly, wealth honestly acquired. The producers of these things—the physician, the trainer, the money-maker—each in turn contends that his art produces the greatest good. Surely, says the physician, health is the greatest good; there is more good in my art, says the trainer, for my business is to make men beautiful and strong in body; and consider, says the money-maker, whether any one can produce a greater good than wealth. But, insists Gorgias, the greatest good of men, of which I am the creator, is that which gives men freedom in their persons, and the power of ruling over others in their several states—that is, the word which persuades the judge in the court, or the senators in the council, or the citizens in the assembly: if you have the power of uttering this word, you will have the physician your slave, and the trainer your slave, and the moneymaker of whom you talk will be found to gather treasures, not for himself, but for those who are able to speak and persuade the multitude. What we call life is divided into occupations and interest, and the horizons of mankind are bounded by them. It happens naturally enough, therefore, that there should be a want of sympathy in regard to these pursuits among men, the politician despising the scholar, and the scholar looking down upon the politician, and the man of affairs, the man of industries, not caring to conceal his contempt for both the others. And still more reasonable does the division appear between all the world which is devoted to material life, and the few who live in and for the expression of thought and emotion. It is a pity that this should be so, for it can be shown that life would not be worth living divorced from the gracious and ennobling influence of literature, and that literature suffers atrophy when it does not concern itself with the facts and feelings of men. If the poet lives in a world apart from the vulgar, the most lenient apprehension of him is that his is a sort of fool’s paradise. One of the most curious features in the relation of literature to life is this, that while poetry, the production of the poet, is as necessary to universal man as the atmosphere, and as acceptable, the poet is regarded with that mingling of compassion and undervaluation, and perhaps awe, which once attached to the weak-minded and insane, and which is sometimes expressed by the term “inspired idiot.” However the poet may have been petted and crowned, however his name may have been diffused among peoples, I doubt not that the popular estimate of him has always been substantially what it is today. And we all know that it is true, true in our individual consciousness, that if a man be known as a poet and nothing else, if his character is sustained by no other achievement than the production of poetry, he suffers in our opinion a loss of respect. And this is only recovered for him after he is dead, and his poetry is left alone to speak for his name. However fond my lord and lady were of the ballad, the place of the minstrel was at the lower end of the hall. If we are pushed to say why this is, why this happens to the poet and not to the producers of anything else that excites the admiration of mankind, we are forced to admit that there is something in the poet to sustain the popular judgment of his in utility. In all the occupations and professions of life there is a sign put up, invisible—but none the less real, and expressing an almost universal feeling—“No poet need apply.” And this is not because there are so many poor poets; for there are poor lawyers, poor soldiers, poor statesmen, incompetent business men; but none of the personal disparagement attaches to them that is affixed to the poet. This popular estimate of the poet extends also, possibly in less degree, to all the producers of the literature that does not concern itself with knowledge. It is not our care to inquire further why this is so, but to repeat that it is strange that it should be so when poetry is, and has been at all times, the universal solace of all peoples who have emerged out of barbarism, the one thing not supernatural and yet akin to the supernatural, that makes the world, in its hard and sordid conditions, tolerable to the race. For poetry is not merely the comfort of the refined and the delight of the educated; it is the alleviator of poverty, the pleasure-ground of the ignorant, the bright spot in the most dreary pilgrimage. We cannot conceive the abject animal condition of our race were poetry abstracted; and we do not wonder that this should be so when we reflect that it supplies a want higher than the need for food, for raiment, or ease of living, and that the mind needs support as much as the body. The majority of mankind live largely in the imagination, the office or use of which is to lift them in spirit out of the bare physical conditions in which the majority exist. There are races, which we may call the poetical races, in which this is strikingly exemplified. It would be difficult to find poverty more complete, physical wants less gratified, the conditions of life more bare than among the Oriental peoples from the Nile to the Ganges and from the Indian Ocean to the steppes of Siberia. But there are perhaps none among the more favored races who live so much in the world of imagination fed by poetry and romance. Watch the throng seated about an Arab or Indian or Persian story-teller and poet, men and women with all the marks of want, hungry, almost naked, without any prospect in life of ever bettering their sordid condition; see their eyes kindle, their breathing suspended, their tense absorption; see their tears, hear their laughter, note their excitement as the magician unfolds to them a realm of the imagination in which they are free for the hour to wander, tasting a keen and deep enjoyment that all the wealth of Croesus cannot purchase for his disciples. Measure, if you can, what poetry is to them, what their lives would be without it. To the millions and millions of men who are in this condition, the bard, the story-teller, the creator of what we are considering as literature, comes with the one thing that can lift them out of poverty, suffering—all the woe of which nature is so heedless. for her, thanks to the poet. But, alas for the poet there is not a peasant nor a wretched operative of them all who will not shake his head and tap his forehead with his forefinger when the poor poet chap passes by. The peasant has the same opinion of him that the physician, the trainer, and the money-lender had of the rhetorician. The hard conditions of the lonely New England life, with its religious theories as somber as its forests, its rigid notions of duty as difficult to make bloom into sweetness and beauty as the stony soil, would have been unendurable if they had not been touched with the ideal created by the poet. There was in creed and purpose the virility that creates a state, and, as Menander says, the country which is cultivated with difficulty produces brave men; but we leave out an important element in the lives of the Pilgrims if we overlook the means they had of living above their barren circumstances. I do not speak only of the culture which many of them brought from the universities, of the Greek and Roman classics, and what unworldly literature they could glean from the productive age of Elizabeth and James, but of another source, more universally resorted to, and more powerful in exciting imagination and emotion, and filling the want in human nature of which we have spoken. They had the Bible, and it was more to them, much more, than a book of religion, than a revelation of religious truth, a rule for the conduct of life, or a guide to heaven. It supplied the place to them of the Mahabharata to the Hindu, of the story-teller to the Arab. It opened to them a boundless realm of poetry and imagination. What is the Bible? It might have sufficed, accepted as a book of revelation, for all the purposes of moral guidance, spiritual consolation, and systematized authority, if it had been a collection of precepts, a dry code of morals, an arsenal of judgments, and a treasury of promises. We are accustomed to think of the Pilgrims as training their intellectual faculties in the knottiest problems of human responsibility and destiny, toughening their mental fiber in wrestling with dogmas and the decrees of Providence, forgetting what else they drew out of the Bible: what else it was to them in a degree it has been to few peoples many age. For the Bible is the unequaled record of thought and emotion, the reservoir of poetry, traditions, stories, parables, exaltations, consolations, great imaginative adventure, for which the spirit of man is always longing. 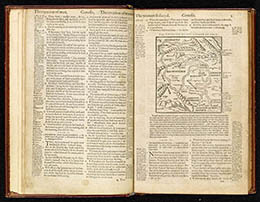 It might have been, in warning examples and commands, all-sufficient to enable men to make a decent pilgrimage on earth and reach a better country; but it would have been a very different book to mankind if it had been only a volume of statutes, and if it lacked its wonderful literary quality. It might have enabled men to reach a better country, but not, while on earth, to rise into and live in that better country, or to live in a region above the sordidness of actual life. For, apart from its religious intention and sacred character, the book is so written that it has supremely in its history, poetry, prophecies, promises, stories, that clear literary quality that supplies, as certainly no other single book does, the want in the human mind which is higher than the want of facts or knowledge. The Bible is the best illustration of the literature of power, for it always concerns itself with life, it touches it at all points. And this is the test of any piece of literature—its universal appeal to human nature. When I consider the narrow limitations of the Pilgrim households, the absence of luxury, the presence of danger and hardship, the harsh laws—only less severe than the contemporary laws of England and Virginia—the weary drudgery, the few pleasures, the curb upon the expression of emotion and of tenderness, the ascetic repression of worldly thought, the absence of poetry in the routine occupations and conditions, I can feel what the Bible must have been to them. It was an open door into a world where emotion is expressed, where imagination can range, where love and longing find a language, where imagery is given to every noble and suppressed passion of the soul, where every aspiration finds wings. It was history, or, as Thucydides said, philosophy teaching by example; it was the romance of real life; it was entertainment unfailing; the wonder-book of childhood, the volume of sweet sentiment to the shy maiden, the sword to the soldier, the inciter of the youth to heroic enduring of hardness, it was the refuge of the aged in failing activity. Perhaps we can nowhere find a better illustration of the true relation of literature to life than in this example. Let us consider the comparative value of literature to mankind. By comparative value I mean its worth to men in comparison with other things of acknowledged importance, such as the creation of industries, the government of States, the manipulation of the politics of an age, the achievements in war and discovery, and the lives of admirable men. It needs a certain perspective to judge of this aright, for the near and the immediate always assume importance. The work that an age has on hand, whether it be discovery, conquest, the wars that determine boundaries or are fought for policies, the industries that develop a country or affect the character of a people, the wielding of power, the accumulation of fortunes, the various activities of any given civilization or period, assume such enormous proportions to those engaged in them that such a modest thing as the literary product seems insignificant in comparison; and hence it is that the man of action always holds in slight esteem the man of thought, and especially the expresser of feeling and emotion, the poet and the humorist. It is only when we look back over the ages, when civilizations have passed or changed, over the rivalries of States, the ambitions and enmities of men, the shining deeds and the base deeds that make up history, that we are enabled to see what remains, what is permanent. Perhaps the chief result left to the world out of a period of heroic exertion, of passion and struggle and accumulation, is a sheaf of poems, or the record by a man of letters of some admirable character. Spain filled a large place in the world in the sixteenth century, and its influence upon history is by no means spent yet; but we have inherited out of that period nothing, I dare say, that is of more value than the romance of Don Quixote. It is true that the best heritage of generation from generation is the character of great men; but we always owe its transmission to the poet and the writer. Without Plato there would be no Socrates. There is no influence comparable in human life to the personality of a powerful man, so long as he is present to his generation, or lives in the memory of those who felt his influence. But after time has passed, will the world, will human life, that is essentially the same in all changing conditions, be more affected by what Bismarck did or by what Goethe said? We may without impropriety take for an illustration of the comparative value of literature to human needs the career of a man now living. In the opinion of many, Mr. Gladstone is the greatest Englishman of this age. What would be the position of the British empire, what would be the tendency of English politics and society without him, is a matter for speculation. He has not played such a role for England and its neighbors as Bismarck has played for Germany and the Continent, but he has been one of the most powerful influences in molding English action. He is the foremost teacher. Rarely in history has a nation depended more upon a single man, at times, than the English upon Gladstone, upon his will, his ability, and especially his character. In certain recent crises the thought of losing him produced something like a panic in the English mind, justifying in regard to him, the hyperbole of Choate upon the death of Webster, that the sailor on the distant sea would feel less safe—as if a protecting providence had been withdrawn from the world. His mastery of finance and of economic problems, his skill in debate, his marvelous achievements in oratory, have extorted the admiration of his enemies. There is scarcely a province in government, letters, art, or research in which the mind can win triumphs that he has not invaded and displayed his power in; scarcely a question in politics, reform, letters, religion, archaeology, sociology, which he has not discussed with ability. He is a scholar, critic, parliamentarian, orator, voluminous writer. He seems equally at home in every field of human activity—a man of prodigious capacity and enormous acquirements. He can take up, with a turn of the hand, and always with vigor, the cause of the Greeks, Papal power, education, theology, the influence of Egypt on Homer, the effect of English legislation on King O’Brien, contributing something noteworthy to all the discussions of the day. But I am not aware that he has ever produced a single page of literature. Whatever space he has filled in his own country, whatever and however enduring the impression he has made upon English life and society, does it seem likely that the sum total of his immense activity in so many fields, after the passage of so many years, will be worth to the world as much as the simple story of Rab and his Friends? Already in America I doubt if it is. The illustration might have more weight with some minds if I contrasted the work of this great man—as to its answering to a deep want in human nature—with a novel like ‘Henry Esmond’ or a poem like ‘In Memoriam’; but I think it is sufficient to rest it upon so slight a performance as the sketch by Dr. John Brown, of Edinburgh. For the truth is that a little page of literature, nothing more than a sheet of paper with a poem written on it, may have that vitality, that enduring quality, that adaptation to life, that make it of more consequence to all who inherit it than every material achievement of the age that produced it. It was nothing but a sheet of paper with a poem on it, carried to the door of his London patron, for which the poet received a guinea, and perhaps a seat at the foot of my lord’s table. What was that scrap compared to my lord’s business, his great establishment, his equipages in the Park, his position in society, his weight in the House of Lords, his influence in Europe? And yet that scrap of paper has gone the world over; it has been sung in the camp, wept over in the lonely cottage; it has gone with the marching regiments, with the explorers—with mankind, in short, on its way down the ages, brightening, consoling, elevating life; and my lord, who regarded as scarcely above a menial the poet to whom he tossed the guinea—my lord, with all his pageantry and power, has utterly gone and left no witness.